It’s time again for a recipe review for the Cottage Cooking Club. This group has spent nearly two years collectively cooking through Hugh Fearnley-Whittingstall’s River Cottage Veg, a vegetarian cookbook filled with recipes for flavorful and relatively simple ways to enjoy your vegetables. For March, Andrea, The Kitchen Lioness and leader of the Cottage Cooking Club, selected an assortment of recipes to use up the last of the late-winter while getting ready to welcome the produce of early spring. I’ll admit that I fell down on the job this month. I selected three different recipes to make, but was only able to manage two. I have ingredients for my remaining selection (vegetable biryani), so if I fit it into our menu, I will share the results next month. The two recipes I made this month got top marks. First up, I made “Vegiflette” Toastie! I love the toasties (open-faced sandwiches) in this book. The topping for this one is inspired by the French dish Tartiflette, a gratin of potatoes, onions, bacon, and Reblochon cheese, though in vegetarian form. Reblochon is currently banned for import into the United States. As a result, I discovered a substitute that might become my new favorite cheese. 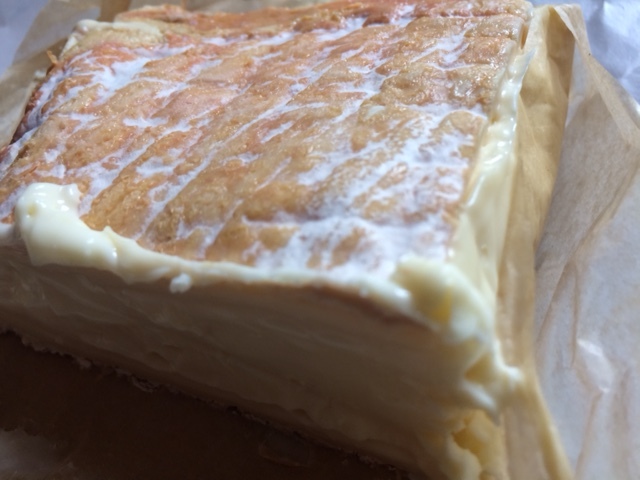 Reblochon is a washed-rind raw milk cheese made in the French Alps. After a thoughtful discussion and some tasting with the cheesemonger at Whole Foods, I settled on her recommendation of Oma, a similarly pungent washed-rind raw milk made in Vermont. The cheese is made by the von Trapp family and aged at The Cellars at Jasper Hill. We had a little laugh about whether we’d sing better (think The Sound of Music –the same von Trapp family) after eating this cheese. In my case, it didn’t help. The toastie topping was simple to throw together for a decadent lunch. You need a little advanced planning to have cold cooked potatoes on hand. 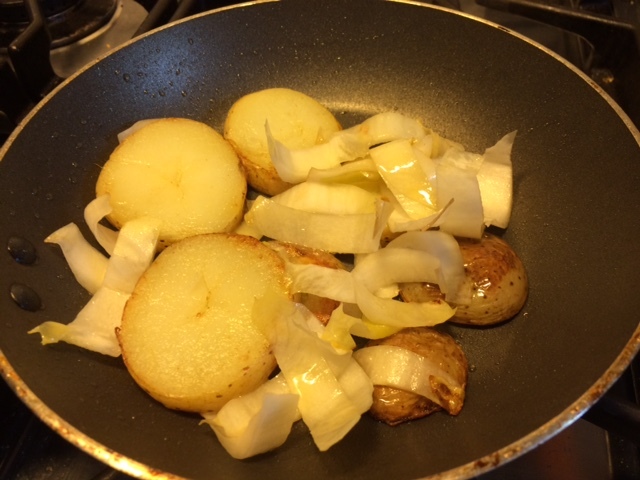 While slices of rustic bread (I made a loaf of no-knead whole wheat) toast, thickly sliced cooked potatoes are pan-fried in some olive oil. Once they’re browned, slices of bitter Belgian endive are added until they soften up. The vegetables are piled on top of the toast, sprinkled with a generous grind of black pepper, then covered with a few pieces of cheese. A few minutes under the broiler melts the cheese and you have lunch. I loved this. I’m also intrigued to try the original dish, with bacon or without, though with the cold weather on its way out, that kitchen experiment might need to wait until next year. 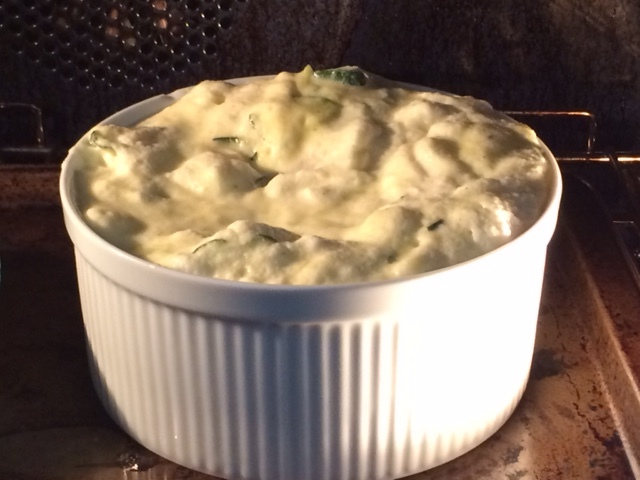 I also made zucchini penne spoufflé. I’d been wanting to try this recipe ever since the group made the spinach version last May. 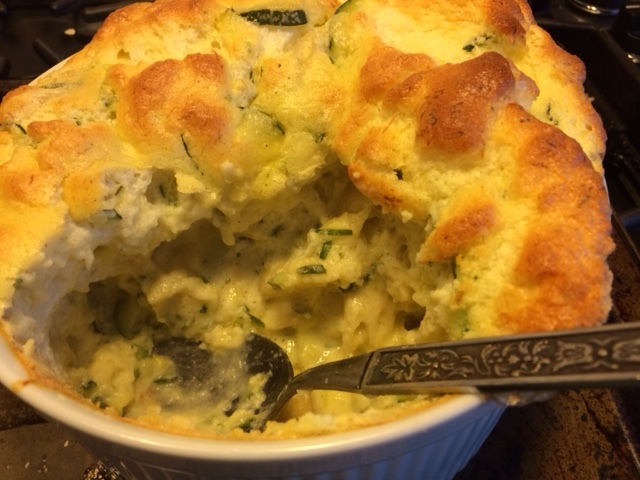 Spoufflé is a cross between mac-and-cheese and a soufflé. It starts with a roux made from milk infused with onion, bay, and peppercorns. I loved learning this infused milk trick when making the fennel and squash lasagna last month. It’s amazing how something so simple adds an unexpected dimension to the finished dish. The roux is enriched with grated cheddar cheese and a healthy dose of nutmeg. Then egg yolks are whisked in to further thicken up the sauce. It wouldn’t be mac-and-cheese without some pasta, plus a chunky puree of sautéed zucchini adds color. Finally, it wouldn’t be soufflé without folding in some stiff egg whites to lighten it up. The whole concoction is transferred to a buttered dish and baked until it’s puffy and golden. 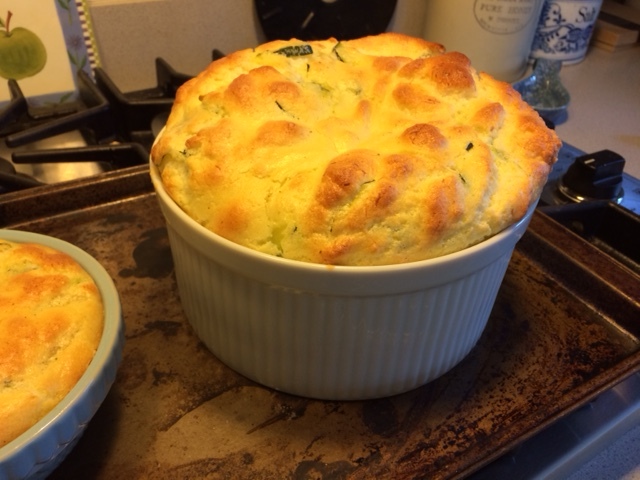 My soufflé dish was a smaller than I expected, so I made a mini-one with what didn’t fit in the larger vessel. I ate this hot from the oven, but the leftovers, slightly deflated, are good too. The toastie was my favorite this month, but I’d definitely make both of these recipes again. I would like try the spinach version of the spoufflé too. Next month will be the final month devoted to this cookbook. Andrea has plans in the works for the group to continue the adventure, cooking through more of Hugh’s books. 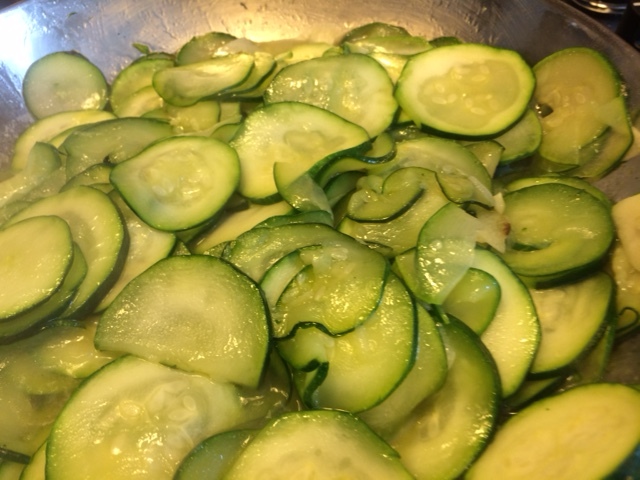 This month, check out my fellow Cottage Cooking Club member’s blogs to read their reviews of March’s recipe selections. Full Disclosure: Beef Stew challenges me. On the surface, it’s perfect comfort food with much in its favor, but I usually only like it, never love it. One thing I’ve figured out is that I don’t like stewed vegetables, especially potatoes, so I tend to favor recipes with just meat and gravy. This week’s selection for Cook the Book Fridays from David Lebovitz’s My Paris Kitchen, Belgian beef stew with beer and spice bread (aka Carbonade Flamande), met these criteria, so I was excited to try something new. To start, chunks of beef chuck are browned. Next, diced onions and bacon lardons are sautéed. The pot is deglazed with some water before adding a bottle of beer. I tried to find a European-style amber, but the only amber at the store was Dos Equis so that’s what I used. 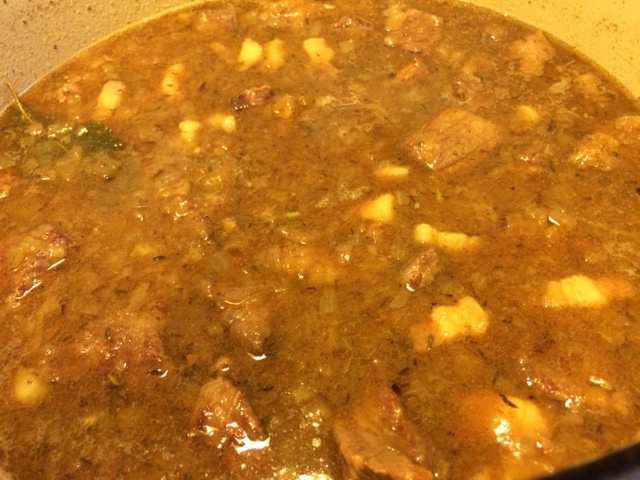 Finally, all the ingredients along with thyme, bay leaves, and cloves spent some time simmering. Now it’s time for the secret ingredient: pain d’épices. What’s pain d’épices, you ask? It’s a honeyed spice loaf, not too sweet and fragrant with a variety of warm spices: anise, cinnamon, allspice, ginger, nutmeg and cloves. The scent reminded me of my favorite holiday cookies, Basler Läckerli. 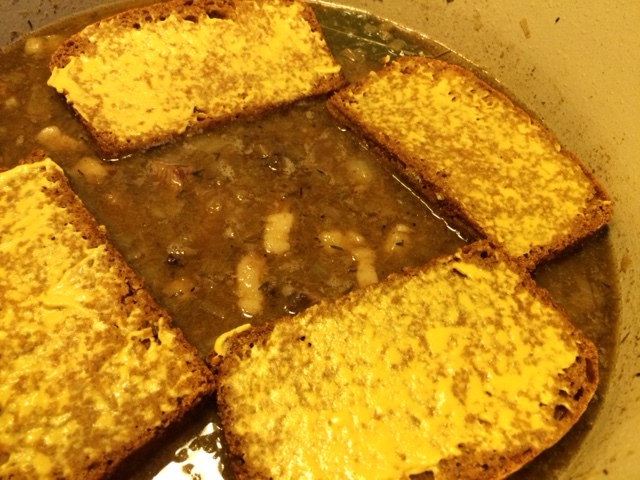 It seems unconventional, but this stew is thickened with slices of pain d’épices lightly spread with Dijon mustard. The slices are laid on top while it stews for a few more hours. Periodic stirring encourages the bread to dissolve into the pot, transforming the thin beery broth into a thick flavorful gravy. I served the stew over a bed of mashed potatoes. 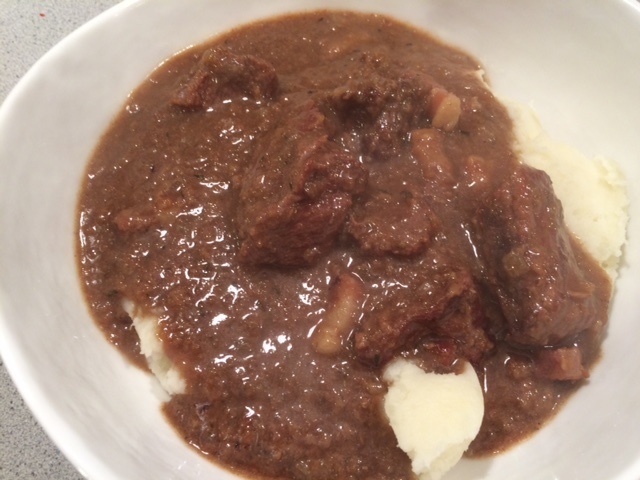 The stew had the simple style I prefer with an unusual and enticing aroma and taste. While I enjoyed this more than many other versions of beef stew, I still just liked-not-loved it. I enjoyed the leftover spice bread more. I brought it to my sister’s. It was a bit dry, but improved when we toasted it for breakfast. Meanwhile, I’ve become obsessed with last time’s dukkah. I made the dukkah-roasted cauliflower 3 times in the past two weeks. I also gave broccoli the same treatment. Equally delicious. And I used dukkah to coat fish fillets when I made Dorie Greenspan’s almond flounder meunière (or should I call it dukkah flounder meunière?) I’m going to have to make another batch. We just returned from a long weekend in Florida for a family celebration. Here’s my favorite nature shot from the trip. 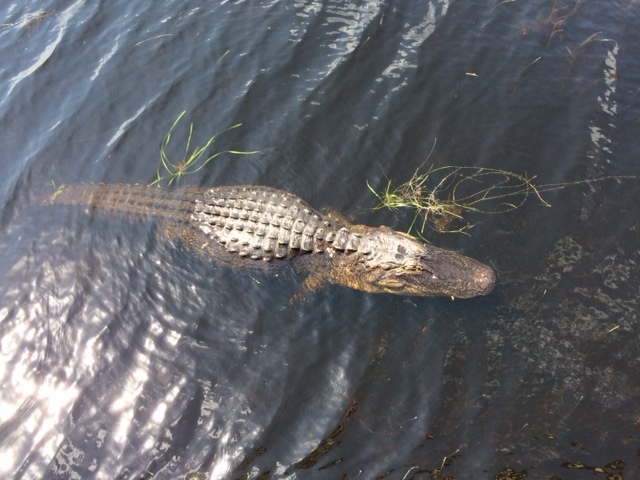 We saw this 15-to-20 foot alligator floating in the water beside the fishing pavilion when we took a walk at Arthur R. Marshall Loxahatchee National Wildlife Refuge. And closer to home, despite a snowstorm predicted for the weekend, spring is in the air. 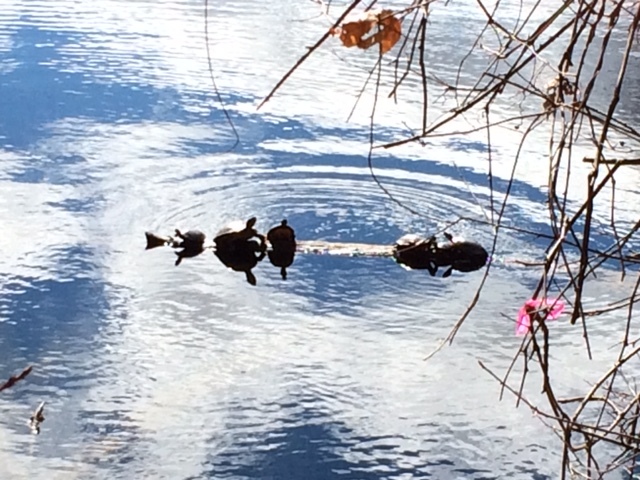 This morning I caught half a dozen turtles sunning themselves on a log during my late-morning walk with Bella. They made me smile. 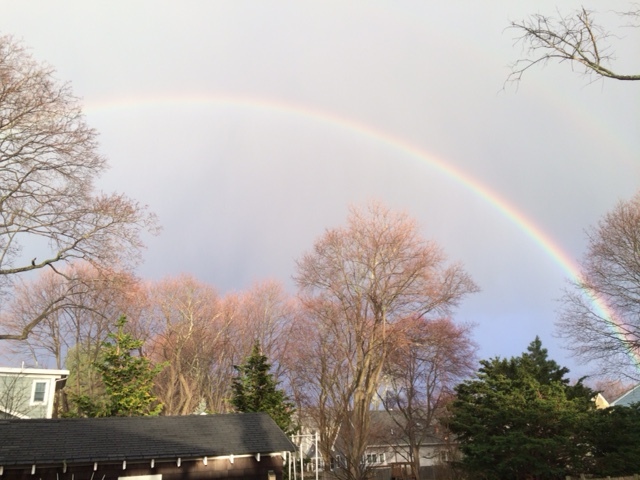 And this evening, we spied a beautiful full rainbow in the backyard! If you want to know how my friends enjoyed their stew, check out their links here. Due to copyright considerations, I don’t publish the recipes here. You can find the stew on page 198 and the pain d’épices on page 293 of David Lebovitz’s My Paris Kitchen. Or feel free to drop me a line and I’ll share with you.